With the summer comes rain. Too much rain and you run into lawn drainage problems. If you don’t find drainage solutions quickly, all of the excess water could lead to more pests, erosion, moldy homes, and even dead plants. If you work with a professional landscaper, you can focus on better drainage so that you have a healthier lawn. 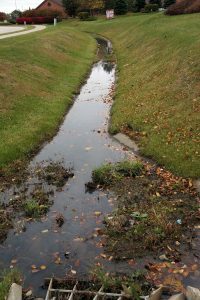 Finding and fixing drainage problem in your yard can save you lots of hassle! A retaining wall is a common solution when there is a lawn drainage issue. The wall helps to block out water that might come rushing into your property from the road or even a neighbor’s property. You need to do all you can to keep water out. If there is too much water coming in from other people’s properties, it doesn’t matter how much drainage you have. It’s going to be a problem. Retaining walls are a custom solution. They are built to the height and length that is needed for your property. Plus, the stones or bricks are chosen to coordinate with your home so they add to the curb appeal as opposed to taking away from it. You need to figure out where the excess water sits on your property. This will make it easier to figure out some of the best solutions. Much of it will depend on the slope of your property as well as your elevation level. Take a look at where you see the most puddles in your yard and across your property the next time it rains. Snap a few photos or even measure just how deep the puddles are. Often, the drainage has to be added by professionals. This can include grates and various plumbing within your yard so that the water has somewhere to go. It’s not likely possible to change the overall elevation of your property, which is why the drainage has to be added in. By working with professionals, you get the problem taken care of properly. This ensures that each time it rains, you gain peace of mind knowing that there isn’t going to be puddles of water pooling around your home. It will allow you to keep the pests at bay and ensure that all of your landscaping thrives instead of dies. Discover some of the different drainage solutions that are available by calling us at (410) 489-9009 or contacting us online. We will schedule a time to come out and discuss options that would work for your home. This entry was posted on Friday, May 12th, 2017	at 3:02 pm	. You can follow any responses to this entry through the RSS 2.0	feed. Both comments and pings are currently closed.